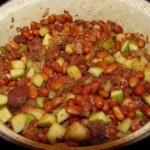 Bruine Bonen met Appels en Spek is a Dutch food recipe for beans with apples and pork. Drain, and bring to a boil the beans and fresh water to cover. Reduce heat and simmer, covered, for 1 hour. Rub the pork with salt, pepper and cinnamon. Dry fry slowly in a hot skillet until the fat runs. Remove from pan and reserve. In the fat rendered from the pork or bacon (add up to 2 tbsp oil if not enough to cover the bottom of the skillet) saute the onions until golden brown. 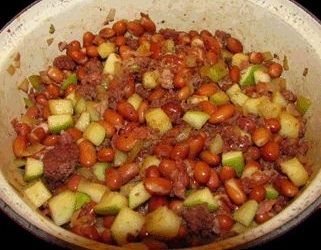 Distribute the beans and apples into soup bowls (with just a bit of the cooking liquid). Top with pork and onions. Serve the molasses on the side for diners to help themselves. Eat with thick slices of hearty bread. I tried this food in Amsterdam. Very good and interesting!